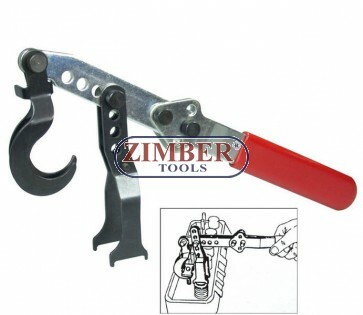 Presa pentru arcuri de supape, ZR-36VSC10 - ZIMBER TOOLS. Compresses overhead valve springs with rocker arm studs. This tool can be used with the head either on or off the engine. Jaws adjust to fit most overhead valve engines. Adjustable handle allows for clearance in tight areas. Presa pentru arcuri de supape 68-130-mm. - 8" - ZR-36VSC08 - ZIMBER TOOLS. Presa pentru arcuri de supape, ZR-36VSC12 - ZIMBER TOOLS. Presa pentru arcuri de supape, SMANN TOOLS. Presa arcuri supape (ZT-05067) - SMANN TOOLS.